On October 9th. 2004 a new group hit London with Aztec music, in the highly successful ‘Rhythms of Latin America’ festival at the Instituto Cervantes, organised by Discovering Latin America in aid of Peace Brigades International. 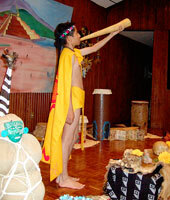 Tunkul not only interpret Aztec music using authentic copies of exotic wind and percussion instruments (from marine conch shell trumpets and giant ocarinas to 5-foot long serpent rainsticks and beautifully carved two-tongued tongue drums), they also support the music itself with fascinating background images and anecdotes based on their research from pre-Hispanic codices. It’s a feast for the eyes as well as for the ears ...! 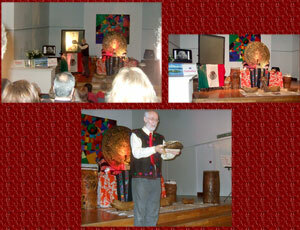 At the same festival, Ian, one of the Tunkul members, gave a lecture/demonstration of Aztec musical instruments to a packed audience. 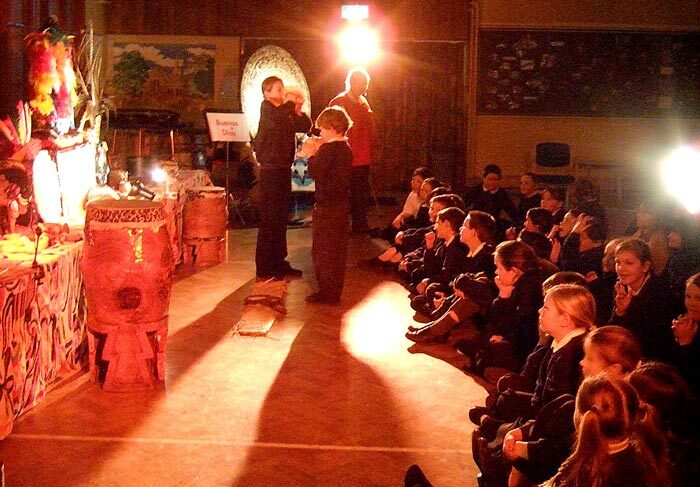 Both Tunkul and Ian offer Aztec music workshops, lectures and performances in schools, colleges, universities, museums, galleries, arts centres and beyond. 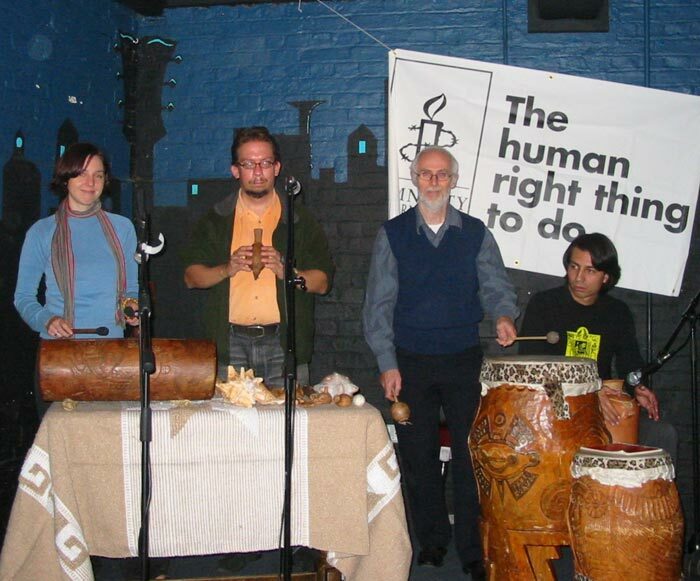 Miranda, Will, Ian and Victor tune up for their gig at the Amnesty International freedom festival benefit in Kingston (15/10/05). 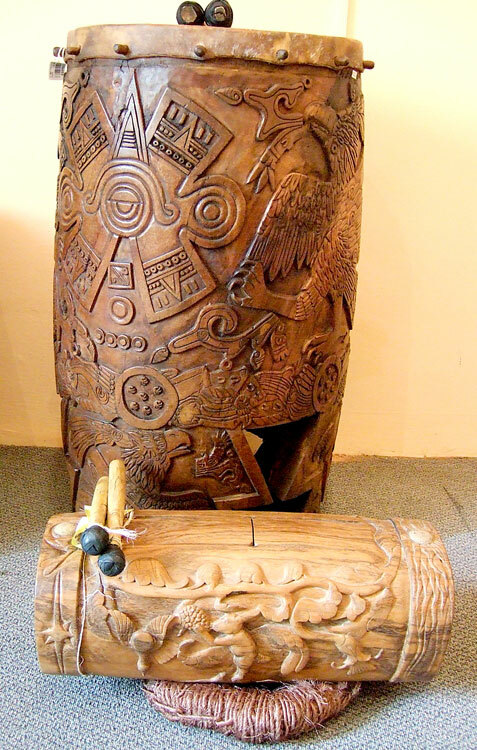 Beautiful hand carved replica ‘huehuetl’ and ‘teponaztli’ drums made by Jaime Flores C. from Malinalco, exhibited as part of a major crafts festival (Festival del Gran Premio) at FONART, Mexico City, autumn 2005. The huehuetl is a replica of the famous metre-high Aztec instrument from Malinalco (now in the Toluca city museum) that came to London in 2002-3 for the Aztecs exhibition. We have been privileged as a team to meet - and see perform - the teaching team Amoxpoani (‘We Who Read The Books’), who bring to life pre-Hispanic music, poetry and ritual in schools and museums in Mexico City. 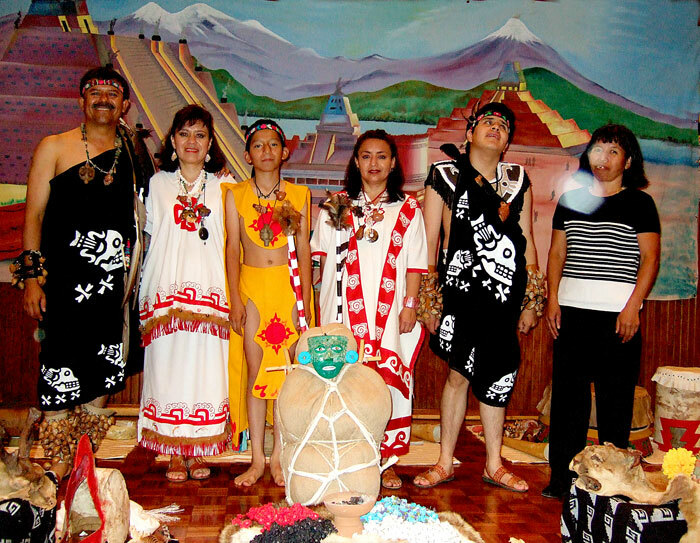 The team is based at the Templo Mayor, is led by teacher Raúl Guerrero Casarrubias, and is composed (apart from Raúl) entirely of volunteers, including one blind student and one 11-year-old boy and his Náhuatl-speaking mother. 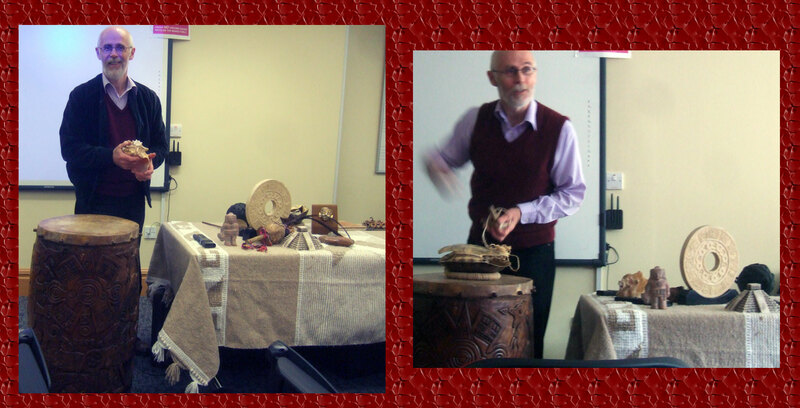 Gerald Crowson, co-founder of ILAMS, wrote after the event: ‘May I say a big thank you for the most excellent presentation you did for us on Friday evening, we got so many new insights into Aztec life, music and culture’. And Ray Picot, ILAMS Secretary, wrote: ‘There was a very positive atmosphere and I learned alot. I’m reading a history of the colonisation of the Americas, north and south, and one thing that these things don’t cover are the people. 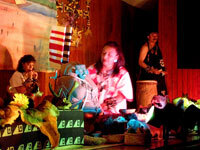 You really brought the Aztec world and its music to light. I shall have no hesitation in recommending you in the future’. Learn more of ILAMS work by following the link below. On Saturday 14th August 2010 Ian gave an introductory illustrated demonstration of some ‘Aztec’ wind and percussion instruments at ‘Rhythms’ - the music and dance festival organised annually by Discovering Latin America. In January 2013 Mexicolore ran 3 workshops for families on Aztec Music at the British Museum for their BM Young Friends ‘Awesome Aztecs!’ day.